Made out of brown alpaca. This rhino has been made in Germany in 2010. He is made especially for the company Pyades Technologies GmbH. He is called Rains and is the mascot of Pyades. Rains is made out of black velvet and has black safety eyes. On the back of his hip is an imprint of the rhino and the word Imagy. 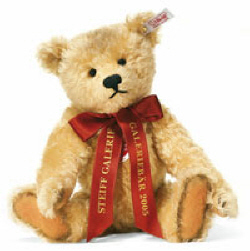 This bear is made in 2008 for the Steiff Galleries in Germany. This small bear is 12 cm. / 4.75" tall. He is dressed in a suit and ready to let the circus start.. He is made for Esaga in a limited edition of 3.000 pieces. 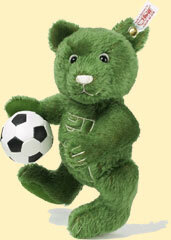 This bear is made for Germany in 2006 to celebrate the world championship football. The bear is 22 cm. / 8.8" tall and it is a limited edition of 2.006 pieces. 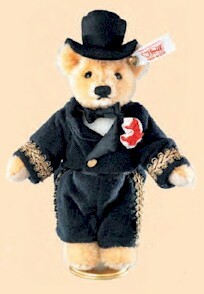 This bear has been made in 2005 for the Steiff Galleries in Germany. 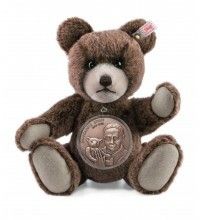 The bear is limited to 1.500 pieces and is stuffed with wood shavings. This wonderful key ring is limited to 1.500 pieces. He is made in 2004 for the department store Karstad in Germany. 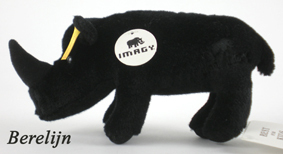 This bear is made for the museum in Giengen in 2004. He is a wonderful colour of pink and he is 28 cm. / 11" tall. This key ring has been made for the department store Karstad AG in 2002. It is a Santa wearing a blue coat and cap and he is 10 cm. / 4" tall and limited to 1.500 pieces. This bear is having a wolf as a hand puppet. The bear is 30 cm. / 12” tall and specially made for the Firm Wolf in Giengen. It is a limited edition of 1.500 pieces. 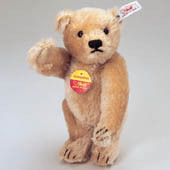 This bear is made for the Steiff Museum in Giengen in the year 1998. The bear is 30 cm. / 12" tall. 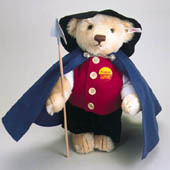 This bear is made to celebrate the 150th birthday of Margarete Steiff. The book is in German and gives loads of information about items Steiff produced. It was a limited edition of 1.000 pieces. 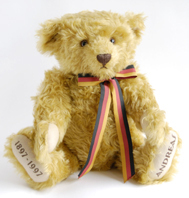 Andreas has been made in 1997 for the department store Kaufhof AG to celebrate the 100th anniversary. He is 40 cm. / 16" tall and limited to 1.997 pieces. 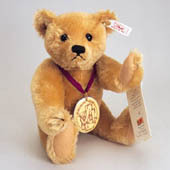 This bear is made for Germany in 1997. It was a limited edition of 2.000 pieces. The bear is 35 cm. / 14" tall. 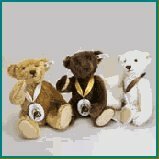 Those wonderful bears are made to celebrate the 150th birthday of Margarete Steiff. They are 28 cm. tall and made in the colours white, blond and dark brown. the dark brown one is limited to 7.459 pieces. Theo has been made for the department stores Kaufhof and Horten in 1996, to celebrate the 50th anniversary. He is 43 cm. / 17.2" tall and limited to 1.946 pieces. 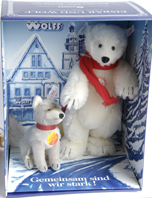 This set has been made for the Steiff shop of Paul Wolff in Giengen (opposite of the Steiff factory). The bear is 32cm. / 12.8" tall and the wolf is 16 cm. / 6.4" tall. The set is made in 1995 and limited to 2.000 pieces.